Have a question that’s not answered below? Click here to send it! Are there other early Christian texts that were influential even though they were not included in the Bible? Yes.The New Testament contains only 27 books, but there are over 100 early Christian writings. Some were never lost (such as the Acts of Paul and Thecla), but others (such as the Gospel of Mary) disappeared for many centuries. Many of these have been labeled “gnostic,” but we don’t use that term, because it has been applied to a wide variety of different groups whose texts do not all share the same perspectives. In addition, the term “Gnosticism” was not used until the 17th century, and it has a derogatory connotation. Are these related to the Dead Sea Scrolls? No. The Dead Sea Scrolls were found outside Jerusalem in 1947. They include the oldest copies of certain books in the Jewish scriptures (the Christian Old Testament) as well as writings of a group called the Essenes. What is meant by ‘extracanonical‘? ‘Extracanonical’ is a general term that refers to more than one hundred texts of early Jesus followers that were not included in the New Testament. Since only twenty-seven books eventually came to be part of the New Testament, there are many ‘extracanonical’ writings. The story of how a certain twenty-seven came to be bound together as a canon is a long and complicated one that is explored in detail elsewhere on this website. What is meant by ‘deutero-canonical’? This is the term for the books at the end of the Old Testament in many Bibles that are not in most Protestant Bibles. 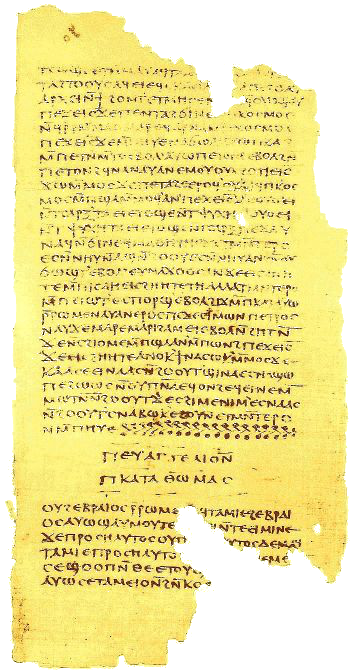 Unlike the rest of the Hebrew texts of the Old Testament, these texts exist only in Greek; therefore, some have argued against their inclusion in the canon. However, in the early centuries of the Common Era, they were part of the widely used Greek version of the Jewish scriptures (known as the ‘Septuagint’). What is meant by ‘apocryphal’? The term refers to the same texts as ‘Deutero-canonical’ (plus about three more). The more pejorative connotation of ‘apocryphal,’ (meaning ‘hidden’) relates to the generally Protestant position of questioning their scriptural authority. What are the New Testament Apocrypha? These are completely different texts never included in any Christian Bible but of great interest. They include writings from the Apostolic Fathers, other Gospels, Epistles, and Acts, and other ancient texts found more recently at Nag Hammadi and elsewhere. Technically these are books whose authors write under a false name, claiming to be someone other than who he or she really is. Therefore, New Testament texts do not apply, since none of them claims authorship. But there are many ancient texts that do fall into this category. A good example is the ‘Odes of Solomon’ because they are not actually written by Solomon but are a collection of early Christian hymns and poems. The Odes would also be classified as apocryphal since they are not accepted in either the Tanakh (Hebrew scriptures) or the New Testament. But Protestants extend the meaning of pseudepigrapha for works that ought to be part of the biblical canon because of the authorship ascribed to them. Thus the exact meaning of pseudepigrapha has shifted slightly to include a religious evaluation. What are the Apostolic ‘Fathers’? They were Christian theologians of the first and second centuries of the Common Era who are believed to have known or been closely affiliated with some of the twelve apostles. Their writings were popular and influential in the evolution of the Christian church, but they were ultimately not included in the canon of the New Testament. Although many of these writings were written in the same time period and geographical location as other works that were ultimately included in the New Testament, they have been highly regarded nonetheless. What are the Nag Hammadi codices? They are 13 leather-bound codices (books) that were retrieved from a red earthen jar near the small town of Nag Hammadi in Upper Egypt and have revolutionized modern thinking about early Christian development. Of the 52 writings they contain, only six of them had been known before. The find-story is laced with shadowy details, but the 1945 discovery of this library of ancient texts that had been lost for 1600 years was a momentous archaeological event. Is there a complete list of early Christian texts including those that are not in the New Testament? No. Various followers of Jesus were reading many different texts in the first few centuries. (The phrase “followers of Jesus” is used on this website instead of “Christian,” a term that appears only three times in the New Testament.) The list of the books used for the New Testament developed only gradually over a period of centuries. Texts continue to be discovered. There are, however, several collections you can consult. See the Resources page. 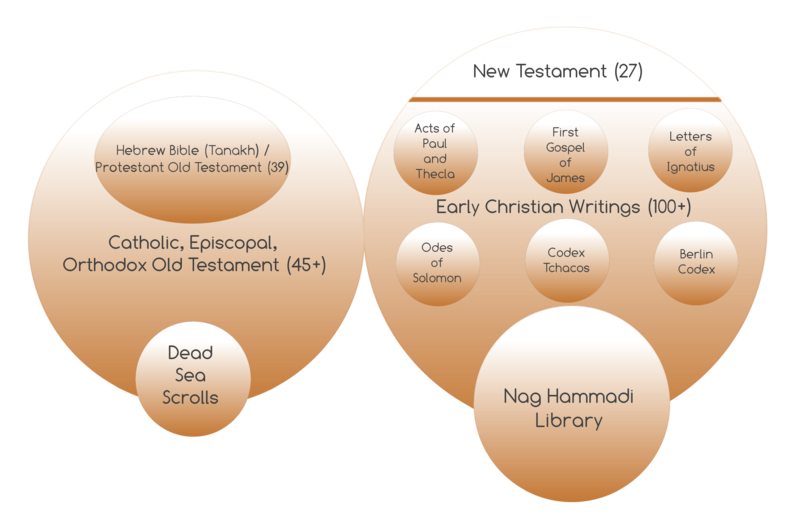 Organizational chart of the best known early Christian texts, created by Deb Saxon. How can I find a good source of English translations for extracanonical texts? See the book list on the Resources page for suggestions. What are the Acts of the Martyrs? Stories of martyrs were read in early assemblies of Jesus followers and then in churches just as scriptures were read. A calendar of feast days for commemorating the martyrs and a way of relating to them developed in the Christian tradition. The way Christians could relate to the martyrs came to be known as the ‘cult of the saints,’ when they would make pilgrimages to the places where their relics were believed to be displayed. Have a question? Someone else might be wondering the same thing! For longer comments or questions, please use the contact form here.